Crystal has had a colorful career in surveying as she grew into the role of President of IBW Surveyors. She started in Alberta designing Forestry Trunk Roads through the mighty Rocky Mountains, living on the land for months at a time. She spent a great deal of time in the rugged Haliburton region and completed her articles in Metropolitan Toronto. Her varied experience allows her to competently retrace a lost Township corner and comfortably lead a conversation in the boardroom discussing the next large condominium project. Crystal’s love of this industry plays itself out daily as she leads the next generation by sharing her knowledge to our young and dedicated staff. She also believes in giving back to her professional association as well as her community, currently sitting on the Complaints Committee and continuing to work with those less fortunate in her community. 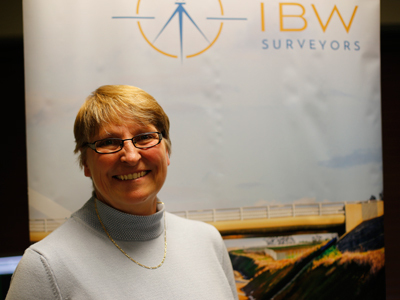 She radiates pride when she speaks of the strengths of IBW Surveyors and the positive changes that lie just around the next corner.